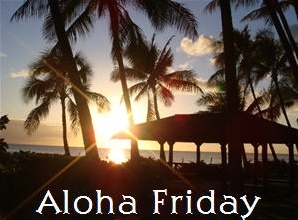 Happy Aloha Friday! I can't believe it's Friday, already! This week has really flown by. My brother has been here for the past week. He's in the Army and just got back from 2 years in Korea. It's been so nice hanging out with him. We've mostly been watching movies, (some scary ones, which are not my favorite,) but it's been great just to spend time with my little brother! Not my favorite genre, but my husband loves scary movies so - I watch them. I love scary movies! But there a some that I think go overboard. i love scary movies! We plan on sitting down this weekend and watching all the older ones from when we were kids.. love it! Scary movies are not for me. I had nightmares for several nights after watching the original Scream. I think that's the last one I ever watched. Tell your brother, thanks for his service! And yes, we LOVE scary movies here! Love them. lol I don't like raunchy horror films though. When I was a child I did. Then as I got into my 20s it was too scary so I stopped watching them. It taught me that you are never too old to be affected by what comes off the screen and also that you can influence your mind and way of thinking with what you see. Every now and then I want to see one and I'll watch syfy, but that's it. I'm the person you don't want to sit next to during a scary movie because all I do is talk about how unrealistic everything is. Yes... most of the time I think they are funny!! There are some that scare me though. I love scary movies. The scariest the better. The first one I remember seeing was at the drive in with my boyfriend, brother and his girlfriend. We saw The Exorcist and it was VERY SCARY!! Especially since we were out in the open and it was pitch black outside. Kind of. I'm not a big scary movie person. I definitely do not like gory-scary. I'm more suspense-thriller scary if I'm going to watch. I think my scary movie watching days are over. Must be a day for that question,LOL. I do watch them. however I only like the mild ones.